Dew Piling recently completed a £150,000 Sheet Piling Project for Simons Group at the Riverside Project, Stafford. The regeneration of “Riverside” is a major scheme on the site of the old Riverside Recreation Centre and the former Tesco and multi-storey car park. The regeneration of “Riverside” is a major scheme on the site of the old Riverside Recreation Centre and the former Tesco and multi-storey car park. The regeneration Project is a £70 million, 18-unit retail development of over 190,000 sq ft to complement and strengthen the Town Centre economy and create new business and hundreds of new jobs in the town. 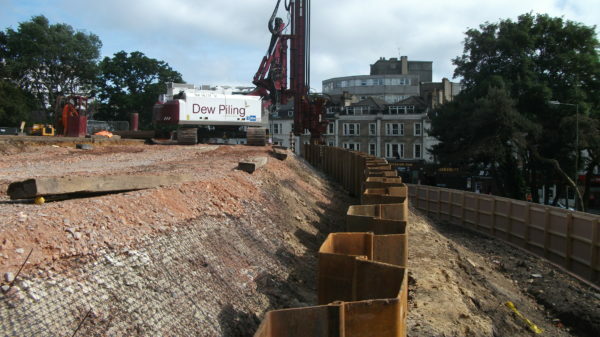 Dew Piling were subcontracted to install up to 100 tonnes of Sheet Piles for a new retaining wall adjacent to the busy A34 Queensway.